Bobby the gorilla, who was one of London Zoo's main attractions, has died. In a statement the zoo said everyone was devastated at the loss of the much-loved 25-year-old male silverback. The central London zoo said their "gentle giant" was found dead in his nest by his keepers early on Friday. Bongo Junior, who was known as Bobby, arrived from Bristol Zoo in 2003 and lived in the Gorilla Kingdom enclosure since it opened last year. The Western Lowland gorilla, whose species is critically endangered in the wild, was described as a "playful but gentle giant" who liked leeks and bananas and disliked spinach. Ralph Armond, director general of the Zoological Society of London (ZSL), said: "Staff, volunteers, members and the general public are devastated by the loss of ZSL London Zoo's gentle giant. "Bobby was a much-loved member of the ZSL family and leaves behind his family of keepers and three female gorillas, Mjukuu, nine, Effie, 15, and Zaire, 34." The zoo will be having a moment's remembrance for Bobby on Wednesday 10 December at 1500 GMT, when visitors and staff can pay their respects to the gorilla by laying a wreath in the courtyard. Gorilla Kingdom, a £5.3m enclosure, which opened on Easter 2007, was the most significant investment at the zoo for more than 40 years and allowed visitors to get close to the gorillas. 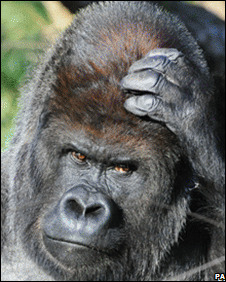 The zoo has pledged to contribute £500,000 to conservation of gorillas in the wild from the development of the exhibit. Western Lowland gorillas are threatened by poaching and the spread of the Ebola virus in their west African homelands, as well as the destruction of their habitat.